Excel charts allow you to do a lot of customizations that help in representing the data in the best possible way. And one such example of customization is the ease with which you can add a secondary axis to Excel charts. But before I get into the mechanics of adding a secondary axis, let me take a step back and explain why it’s needed. 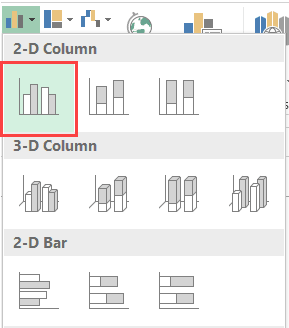 Why Add a Secondary Axis in Excel Charts? Let me try and explain this by using an example. 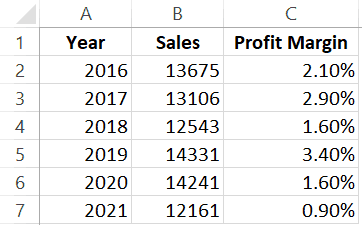 Suppose you have the following data set of Sales and Profit margin of a company for six years. Below is the chart that I have created using this data. 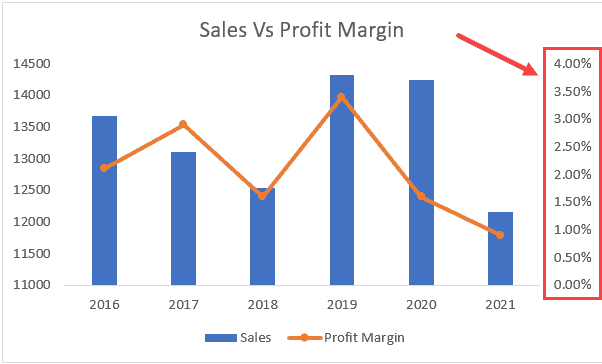 The blue bars represent the sales value and the red ones (the little bars next to the blue sales bars) represents the profit margin. 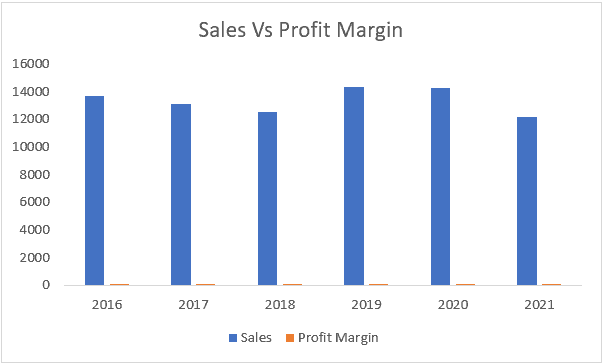 What if I ask you to tell me how much change happened in profit margin in 2019 (compared with 2018). I am sure you can’t tell by looking at the chart. But if you look at the numbers, the profit soared by 125% in 2019. And that’s the issue with this Excel hart. When you plot all the data on the same axis, you lose the ability to compare data of different scales. While Sales numbers are likely to be high, profit margins are usually very low values. And these two can’t be plotted on the same axis. Solution – adding a secondary axis to plot the profit margin numbers. So, we add a secondary axis to the mix and make the chart better (as shown below). A secondary axis has been added to the right which has different scales. The lowest value is 0% and the highest is 4% (which is determined by the profit margin percentage values in your dataset). 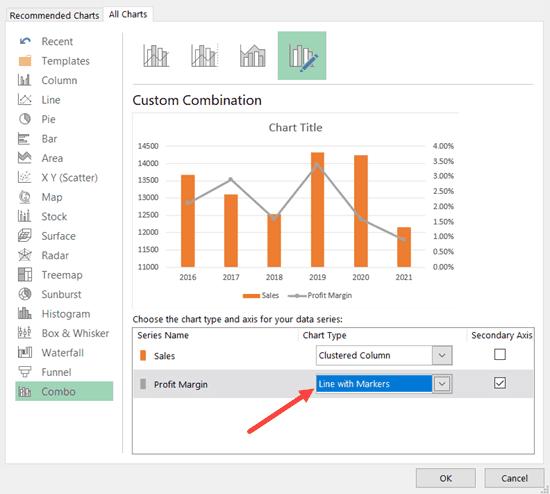 This combination chart now allows you to see the variation in both series of data – Sales and profit margin values. 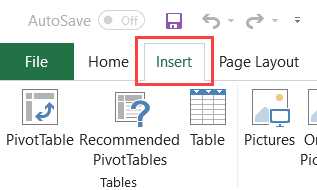 Adding a secondary axis is very simple in all the versions of Excel (more so in the latest ones). In this section, I will show you the steps to add a secondary axis in different versions. 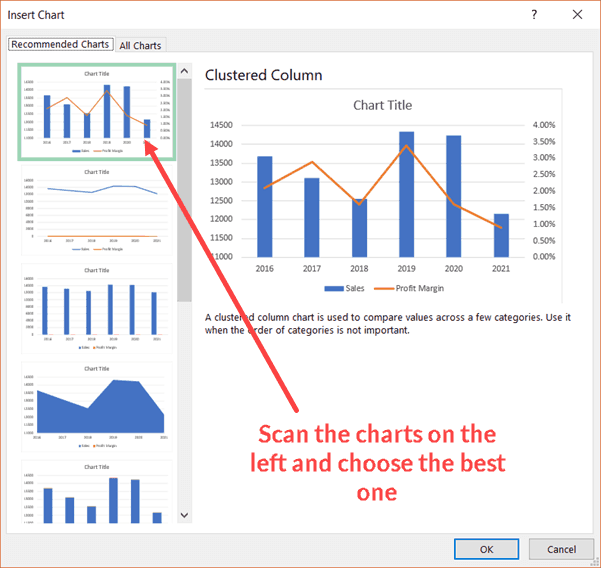 In Excel 2013 and higher versions (Excel 2016, 2019 and Office 365), there is a quick way to create charts using the recommended charts feature. This feature quickly analyzes your data and show you a few options. If you have a simple dataset (like the one we are using in this example), it’s likely that recommended charts will show you an option that already includes a second axis as a part of the chart. In the Charts group, click the Recommended Charts option. This will open the Insert Chart dialog box. Scan the charts in the left pane and select the one that has a secondary axis. Note: You also get other chart options that you can use. Excel tries to be helpful but may not always be on point. If you don’t find the chart that you want to use, you can create it manually (covered next). One of the things I like about the ‘Recommended charts’ feature is that it identifies the time data (such as years or months). This sometimes doesn’t happen when creating a chart manually, in which case you have to manually set the axis value. In case the ‘Recommended Charts’ feature does not work for you, there is always the option to do it manually (only takes a few clicks). In the Charts group, click on the Insert Columns or Bar chart option. Click the Clustered Column option. 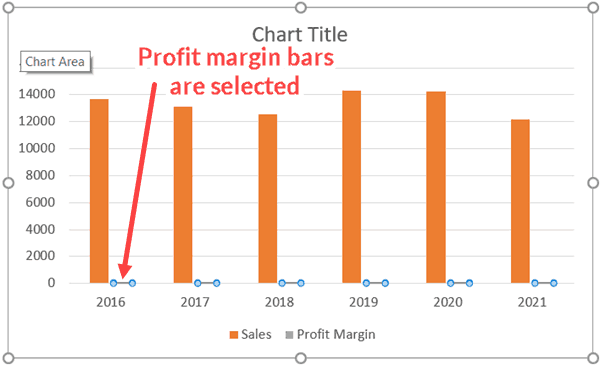 In the resulting chart, select the profit margin bars. If these are too small to select, select any of the blue bars and hit the tab key. 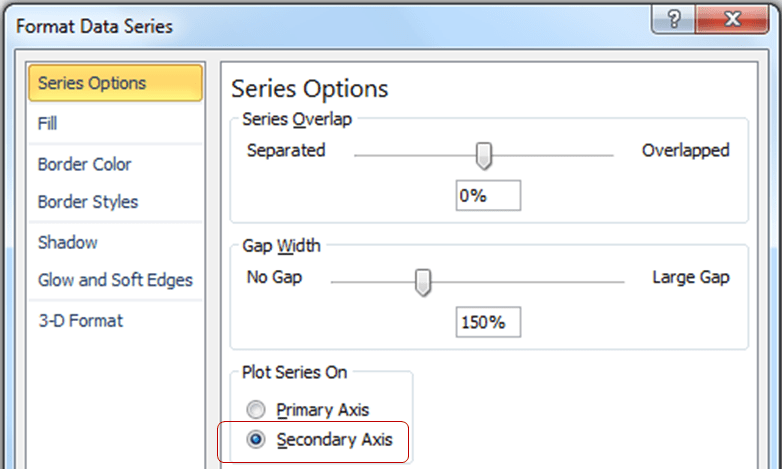 In the right-pane that opens, select the Secondary Axis option. This will add a secondary axis and give you two bars. 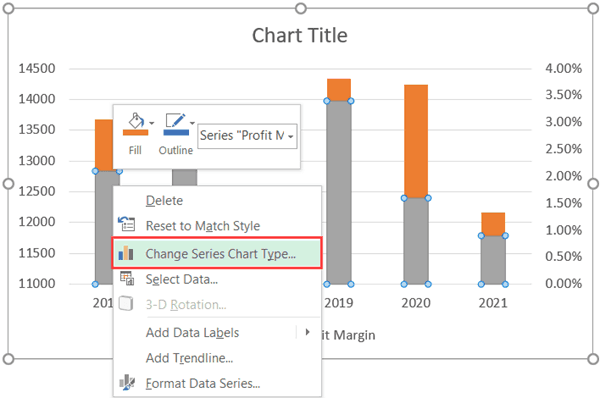 Right-click on the Profit margin bar and select ‘Change Series Chart Type’. This will give you a chart that has the secondary axis and the chart type of data on a secondary axis is a line chart. 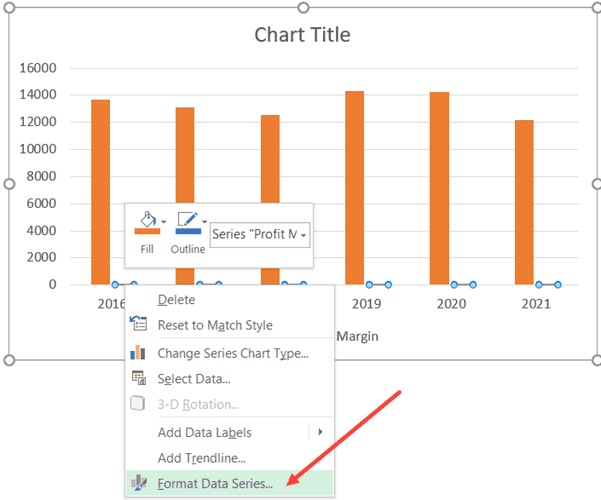 You can also format the line by right-clicking and selecting the Format Data Series option. Simple things such as making the line and columns in contrasting colors can make your Excel charts professional and easy to understand. Caution: In case you have a dataset where the axis values are numbers (such as years), the column chart you create may not be what you expect. It’s likely to consider the year’s data as something that should be plotted in the chart as bars instead of the axis (the axis in such case takes the numbers 1,2,3 and so on..). The fix here would be to delete the series where the year’s data has been plotted as columns and then manually change the axis or convert the axis values in the dataset into text. Note that in the above example, we are adding a vertical secondary axis. Note: When creating Excel charts, it’s always a good idea to keep in mind that these might be printed. In such cases, using light and dark colors to show contrast can help even when the printed charts are seen (which are often printed in black and white). Click the chart. This will also make visible the Chart Tools tab. This is a contextual tab and appears only when you select a chart. After selecting the column, click on Format selection. This will open the Format Data Series dialog box. Removing the secondary axis is as simple as hitting the Delete key (literally). 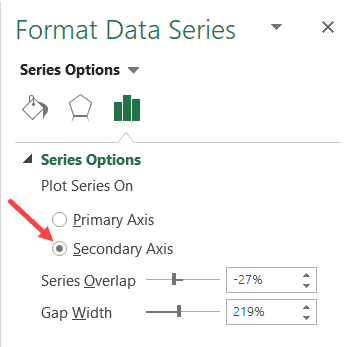 To delete a secondary axis, click on it. Hit the Delete Key (or right-click and click on Delete). Note: In most cases, you’ll need to add a vertical secondary axis only. But in cases, you want a horizontal secondary axis you can use the same steps to do add it.